While I don't have nearly the ill will towards CDs that I have towards cassettes, I still don't really like buying them anymore. It just doesn't really feel like I own the record the way I do when I pick up something on vinyl. That being said I have so many CDs, many of which never came out on vinyl, so it's not like Unlikely Friends are going to be lonely on the shelf they end up on. This is the only record that ended up on my Absolute Best Records Of 2016 list that I hadn't reviewed prior to sharing the list. They reason? Because it only came out on CD. I kept putting off buying the record in the hopes that eventually someone would press it on vinyl. It was available as MP3s. Then as a cassette. 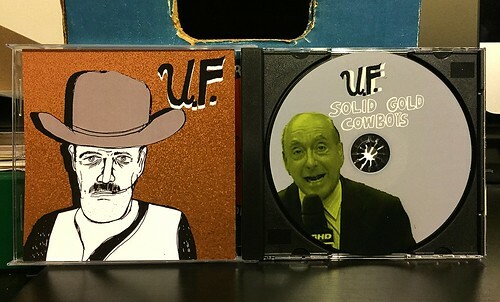 Then as a CD. I figured that vinyl should surely be just around the corner, but it never happened. Maybe it will someday. If it does, I will buy immediately because I love the record. Featuring members of another favorite band of mine, Boat, Unlikely Friends are plugging away with a similar stain of catchy and quirky indie rock. Kind of like Pavement, Archers of Loaf and Built To Spill all mixed up into an upbeat guitar pop. The lyrics are somewhat irreverent, the vocal melodies soar and musically the band branches out and takes chances, but they never sacrifice the hook while trying to do something weird. Essentially this is just one of the best indie rock records of the 1990s that came out in 2015 by mistake. I hope this doesn't signal the end of Boat, because I would hate to see those guys stop putting out records, but I'm happy to get some more Unlikely Friends records as well. Though they really should do vinyl next time. Unquestionably needs a vinyl release!